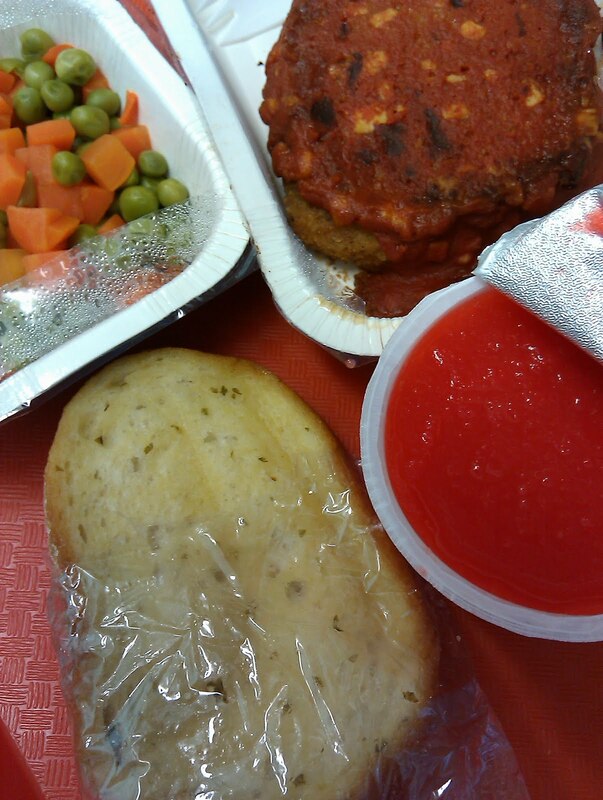 Day 102: chicken parm – back in the saddle again! Today I guess I’m like Gene Autry strumming a guitar singing “Back in the saddle again.” He’s got a horse and I’ve got a spork! I feel lucky to live in a country that provides free lunch to needy, hungry children. I haven’t said that before, but I believe it. Many poor countries cannot afford to even educate their children and here in the US we provide a free education (and lunch) for anyone even children with special needs. It’s one of the things that makes America as great as it is. “Rags to riches” is part of the mythology of America and it’s built on an American education. I came from immigrants. My great-great-grandmother sold fish on the street and my grandfather (now age 90) would tease her about it by yelling “fresh fish!” The GI bill sent my grandpa to college and it changed his life and the lives of his three children. Education is everything. Theses lunches nutritionally “check the box” and empty tummies get at least partially full of calories. I just wish our country could do better: more fresh food and less processed “stuff,” more time to eat, and a little nutrition/cooking education thrown in. It’s time to re-imagine school lunch and value it as a legitimate part of the school day. yay! i've missed these school lunch posts! Yes, red food coloring does have a taste! I wouldn't say it's sweeter, though. It's sort of a bitter, blech after-taste. Wilton actually makes tasteless red food coloring paste for cake decorating. I know a lot of people who can't tell that red food coloring does have a taste, but I also know a lot of people who can. 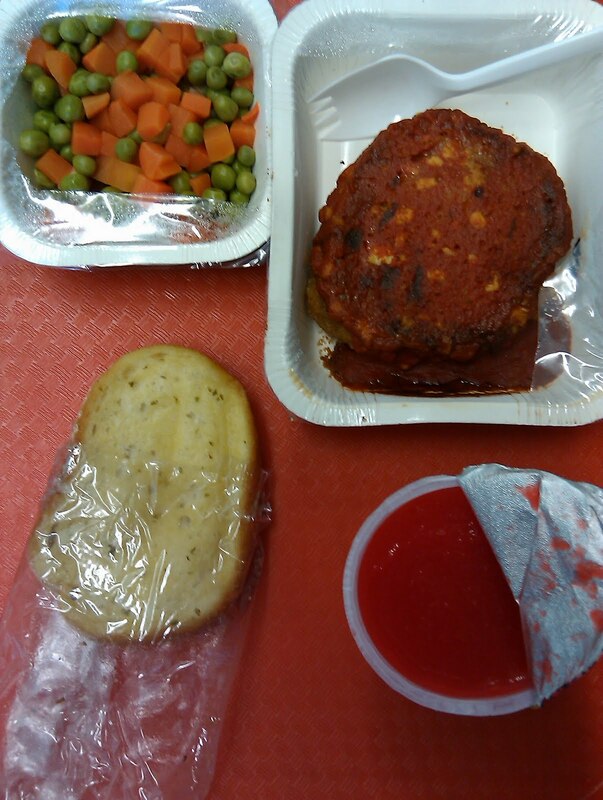 And, so glad the lunch posts are back, not that I really want to see what kids in our schools are eating. But, I guess at least they're eating something. I had NO idea about the chicken. But I am glad that we feed children at school. What a meal to start the school year. Glad you're back in the saddle, Mrs. Q! Hmm. Somehow I had imagined that over the summer, your school would have wised up, and you would have returned and been given a grilled, seasoned chicken breast on a bed of organic dark leafy greens. I see it is not so. I admire what you are doing here. Keep it up. To think they might have tried something new with a new year. That stuff is scary. Good luck to part 2 of your project! I have no idea what is in the apple sauce your school uses, but I just have to say that not all applesauce is the same color. My friend and her siblings bottle their own apple sauce every year using the brightest red apples they can find. They have a competition to see who can make the reddest apple sauce. We make our own apple sauce (just core apples, steam them for five minutes and throw them in the food processor or blender) and it always turns out very pink. We use Gala apples. The saddest part for me is that many do not realize that the food you are served is not normal. I don't understand how our government cannot take heed and "reimagine" school lunch so our children can take better advantage of the great free education they have a right too. Welcome(?) back to lunch! I liked the bit you wrote at the end of this post. Well said. I find it disappointing that so many schools are cutting the Home Economics program (now FCS) where students learn nutrition and how to cook for themselves. I was a 25 year old 7th grade FCS teacher and the school system cut the program to replace it with a Chinese language program. The government partially funds both programs, the Chinese program just brought in more money. How backward is it that the White House is all about nutrition and their home garden, but the government funds Mandarin Chinese before teaching kids about those things in school. I've been reading your blog for awhile and once again, I have to question the common sense of individually packing and sealing each and every dish they put on your tray–especially when most of the products are "heat and serve" to begin with. Take the chicken patty, for example. That wouldn't have been nearly so horrible if they'd shipped them to the school in bulk alongside a bucket of sauce to be reheated and spooned over the patties just before serving. Has the funding for our "lunch ladies" gotten so bad that they can't even heat and scoop anymore? I'm not saying it would improve the nutritional value of the food at all, but it would at least improve the taste and quality of it a bit. Plus, it'd keep a lot of those little plastic/oven-proof boxes out of the landfills. Overheard at the pool over Labor Day Weekend: "I think the lunches are marginally better. For example, today they had corn dogs, mac and cheese, and broccoli instead of corn dogs, mac and cheese, and french fries." I guess glacier paced progress is still progress. "I just wish our country could do better: more fresh food and less processed "stuff," more time to eat, and a little nutrition/cooking education thrown in. It's time to re-imagine school lunch and value it as a legitimate part of the school day." AMEN to that, well said. We really need to realize that proper nutrition will aid in the teaching/learning of our students. Also, why in the world do they need to add food coloring to applesauce?? I mean really, kids will eat applesauce even if it is natural color. Totally disgusting, but did give me a little chuckle. What the heck the appeal of red applesauce?!? Yea! yucky food pictures are back! So sorry that you had to eat that faux food. I am continually amazed at the amounts of food dye that are fed to children. It can cause all kinds of problems for those who are sensitive to it. I'm glad you found a use for that picture of mechanically separated chicken! It was one of the most enlightening articles I came across all Summer. Thanks to B at the Lunch Tray for turning me on to it. I credit it with even giving my oldest daughter pause about processed chicken products. Yes, I CAN taste red dye. Red velvet cake is the main item I can taste it in, but red applesauce is another. Ew. Sadly at the start of this school year I learned that my kids' middle school has removed their salad bar due to bacteria issues (angry) and now offer Papa John's pizza daily to add to their other option of a Chick-fil-A sandwich!. Is it such an issue to just demand that the staff take better care of the salad bar?!? I pack my kids' lunches now ~ but I am now remarried and can afford to do so. For years, as a single mom, financially I had to depend on the reduced meal program to help feed my kids. And this is what they offer. As a person who was raised to think that food came from a gas station not a garden, what is our school system teaching our kids now? It just saddens me. And how you can stomach eating what you do for this project is beyond me! I have to give you so many props for that! My first little chick just left the nest and started Kindergarten yesterday at a Chicago Public School. The only thing I heard about school yesterday was that she didn't eat her lunch because she didn't have time. Today she wanted to try the school lunch so I let her even though I quiver at the thought of what she's getting. I know their lunches are catered by Chartwells. I told her she could have school lunch once in a while but that she had to bring a packed lunch most days. 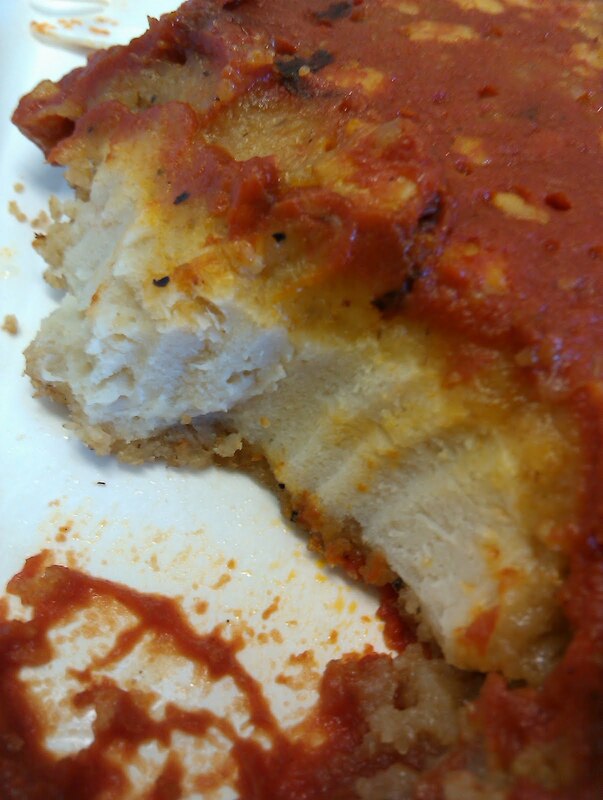 Yeesh, we had chicken and eggplant parmesan last night, and it didn't look anything like that! I appreciate your sentiment at the end … I am also a child of immigrants, and my public school gave me chances my parents certainly never had. I will always be grateful, and am a HUGE booster of my kids' school. Wow, that is a truly awful picture –that link to the "advanced meat recovery" stuff. Yuck! It's a pity that the American public education system that was so beneficial to your grandfather is failing so many students today –not just because of the lousy food, but also because of large class sizes and lack of resources. I posted that mechanically separated "chicken" picture on Facebook and instantly grossed-out all my friends! But they also learned something, and hopefully they will think before putting that disgusting "product" in their bodies or those of their children. Thanks for the link! Thank you so very much for exposing what is going on in our schools. In Japan elementary schools provide a very healthy delicious lunch everyday. In Japan school lunch is a part of the school experience. Students serve the meals and there is a new vegetable introduced each day. The lunches are made fresh each day on site. The menu varies a great deal. The whole idea is to teach children about their culture – not simply to fill their bellies. How I wish we could do this here in the USA. "It's time to re-imagine school lunch and value it as a legitimate part of the school day." Mrs. Q, as a teacher, how do you think that I could get buy-in from teachers or administration to support & value meals? Are the foods always packaged individually in plastic? Holy moly talk about extra garbage! I graduated high school less than a decade ago and it was not a free education…and I went to public school. Between book costs, all sorts of fees, etc it was hitting over $200 each year – if you wanted to go into sports, be willing to fork over $50 per sport, $50 if you wanted to drive to school since you had to pay for a parking spot, etc. Number one reason I don't eat chicken nuggets/patties anything more. Thanks for reminding me. What about grilled chicken breast instead of a fried breaded mystery patty? How many years are you doing this? You say one year of eating a school lunch, but did you start in the middle of the year because you on day 102? So you have 78 to go? I love reading this blog btw. Every day in 2010, so it was the last half of the last school year and the first half of this school year. My son can't have artifical dye. Seeing that applesauce made me sad. And that chicken just looks horrible. Glad to see you back Mrs. Q. Good luck! At first I was going to say, "I never ate that good in elementary school…"
Then I clicked the link to see the mechanically separated chicken. Frankly, I think it looks delicious, but man… that's disgusting. I don't blame you for not finishing the chicken.